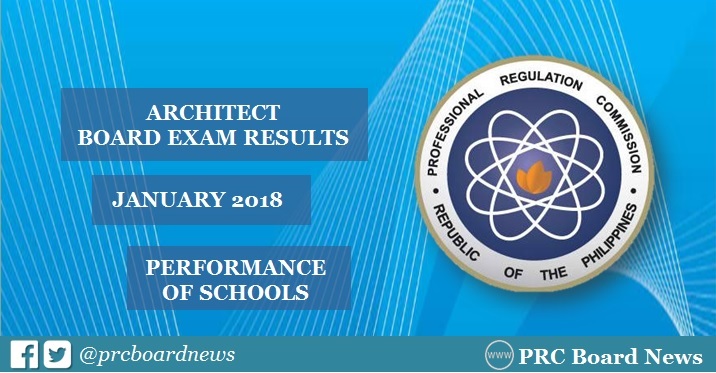 MANILA, Philippines - The Professional Regulation Commission (PRC) recognizes the top performing schools in the January 2018 Architect board exam or Architect Licensure Examination (ALE). The result was officially released on Thursday, February 1, 2018. University of Santo Tomas (UST) dominated the schools with 85.71% or 120 out of 140 passed the exams. Mapua Institute of Technology (MIT) ranked second with 81.48% or 44 out of 54 successfully hurdled the tests. PRC administered the first ALE this year in Manila, Baguio, Cebu, Davao and Legaspi on January 26 (Friday) and 28 (Sunday). PRC named University of Santo Tomas (UST) as the top performing school in the January 2017 architecture board exam, 81.75% or 112 out of 137 passed the exam. UST also aced the January 2016 board exam, 86.08% or 167 out of 194 successfully hurdled the tests.